Come to learn about poverty and missions, both from those who have committed their lives to serving the poor and from your brothers and sisters experiencing material poverty. Come to be with and serve alongside the church of Haiti. Come with a listening ear and a generous spirit and be a blessing in the lives of those who are working full-time in ministry. September–May teams are focused on serving alongside Grace Emmanuel School. This might include helping to facilitate special events, teacher appreciation days, and general staff appreciation days. If you sponsor a student through JiHM’s sponsorship program, visiting during the school year allows you a guaranteed opportunity to meet your student, visit his or her home, and spend quality time connecting with and encouraging him/her. Expect to spend time connecting with adult staff and children in direct ways. Summer teams will be focused on camps and outreach programs through Victory Bible Church. Teams will take part in summer day camps for students from Grace Emmanuel School and outreach programs, partnering with the pastors at Victory Bible Church to share the gospel with our community. Expect a more physically demanding trip during summer. 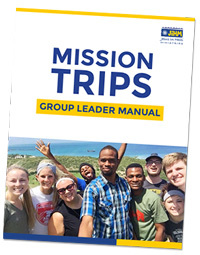 For all the details, read the Mission Trips Team Leader Manual. First, if you have a specific time when you’re available, check the available weeks listed on this page to see if your requested week is vacant. Summer weeks fill up quickly. Next, contact us to let us know you’re interested in leading a team. A $500 non-refundable, non-transferrable deposit is required to reserve a week. If you are interested in serving with JiHM but don’t have a team, we would be happy to try to connect you with an existing group. Please contact us.